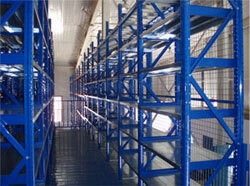 Long span Shelving is constructively similar to Light Pallet Racking but designed to store non-palletized goods. This is an intermediate application between Light and Heavy Duty applications. Long span Shelving is designed for loading/unloading goods manually [without mechanical]. Stored goods can be from smallest components to large and awkwardly shaped items. Long span is particularly suitable for automotive components, supermarkets, libraries, hospitals and pharmacies etc. The systems is available from single-tier for simple requirement to multi-tier applications (up to 4 tiers), utilizing full warehouse height. Access to each level is available through mezzanine floors between the racks. High bay Long span racks are also available above 3 meters high with man-up stacker crane or order picking trucks. Pick & Deposit is done manually. Available from 1300mm to 2700mm Clear Entry beams are clipped to frames and are adjustable at a pitch of 50mm. Each level has boxed, stepped or J-beams using epoxy painted steel or wooden shelf panels. Steel shelves with dividers are also available.